Series, HT-700 Series, and HT-800 Series. ● Choice of 3 batteries: 4 hr, 8 hr, Intrinsically Safe (4 hr). ● Choice of 5 filter types: P, A2P, KP, ABEP, A2BEKP. ● Filter covers reduce dust & sparks entering the filter body. good freedom of movement especially in smaller spaces. 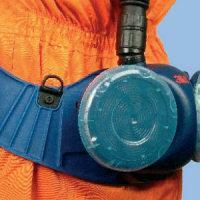 ● Ergonomically designed belt improves user comfort. ● Particles e.g. fine dusts, mists and metal fume. ● Particles & gases combined. 3M Jupiter Powered Air Respiratory QRS Lightweight Tube. 008-00-42P3 3M QRS Lightweight tube connects to head top with 3M turbo/Air fed belt units. 3M Jupiter Intelligent Battery Charger. 003-00-58P Code: 200298. 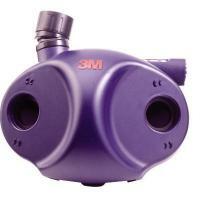 3M Jupiter Powered Air Respiratory QRS Lightweight Tube. 254535 008-00-41P3 Rubber tube to connect to 3M QRS head top with 3M turbo/Air fed belt units. Rubber offers more resistance to chemical vapours. HT-120 Head Top for Powered Air & Airfed Systems. Conforms to EN 12941 with the Jupiter Turbo Unit EN146(rev) with the Dustmaster Air Filter Unit EN1835 with 3M Air Fed Belt Units.